For my final project, I sought to further explore a question I discussed in earlier blog posts: should the greatest priority in book digitization be maintaining fidelity to the exact appearance of the printed text or recreating the author’s intended user experience with some artistic liberty? George Herbert’s The Temple provides an interesting lens from which to view this question. I’m by no means a poetry scholar, but George Herbert seems to be one of the earliest champions of shape poetry – the typographical arrangement of text into an overarching figure – and the way in which he sculpts his text adds significance to his poems. Nabokov places an emphasis on the senses in the quintessential reading experience. The reader must be able to place themselves in the “author’s mind” in order to “see,” “hear,” and “visualize” the components of the experience that the author painstakingly crafted with text. The reader must sense the author’s true aims in order to achieve the “harmonious balance” of understanding between author and reader. Because of Nabokov’s emphasis on stimulating the reader’s sensibilities as an essential element of the reading experience, I contend that bringing to life the author’s intended reading experience matters more than replicating a text with exactitude when crafting a digital form of a book. I have utilized the aforementioned argument as a guiding principle throughout my digitization of six poems from Herbert’s The Temple. Some of these poems originally appeared in the form of shape poetry; others did not, but presented a trope or extended metaphor that proved central to the poem’s meaning, which led me to convert a few unshaped poems into shape poems. I’ll present each poem that I’ve digitized, as well as reflect on what its digitization preserves from the original user experience, adds to enhance the poem’s significance, and masks from the modern reader. In my final digitization of “The Altar,” I mimicked George Herbert’s original altar-like shape of the poem and added an attempt to capture the damaged nature of the altar described in the first verse. When a reader hovers over each stanza of the poem, they can visualize the slab of the altar that it represents, but there remains a disconnect between each slab of the altar; the reader will never be able to visualize all of the slabs at once. My addition, I argue, enhances the meaning of “The Altar” for the modern reader. Although Herbert characterizes the eponymous altar as “broken” two words into the poem, the overarching altar shape of the text eclipses the six character word “broken.” I question George Herbert’s design decision here: if he intended that the altar be “broken,” why did he not reflect its dilapidated appearance in the shape of his poem? Since no Christian is free of sin, it follows that no human-constructed altar should be broken. Thus, I altered “The Altar” such that its shape is truly broken; the reader can visualize that the text synergistically creates an altar shape, but the hover effects that I coded emphasize the incomplete status of the altar’s construction. Despite its title, Herbert did not originally publish “The Collar” as a shape poem. Nonetheless, its meaning seems tied to the clerical collar, which Christian clergymen often wear as a symbol of their responsibility to model God’s purity in word, thought, and deed. A few verses into the poem, Herbert asks “Shall I still be in suit?” Assuming this “suit” refers to the outfit that clergy traditionally wear (even if only as a symbol), Herbert appears to debate whether to abide by or abandon the stringent religious rules of his church. Though the word “collar” never appears in the poem’s body, “The Collar” depicts someone (possibly George Herbert himself?) grappling with faith. The eponymous image stays in the reader’s mind throughout the poem because “The Collar” illustrates someone who at first deeply wishes to rid himself of the church’s influence – to take off the collar, so to speak – but then returns dutifully back to God in the last quatrain. Because “The Collar” encapsulates someone’s struggle with a metaphorical collar, I chose to turn it into a shape poem in my digitization. I split the poem into six chunks – roughly where each thought ended with a period – and fashioned each chunk into its own circle. Each of the six circles has a unique circumference. In order to draw attention to the narrator’s growing disenchantment with Christianity, I gradually disintegrated the circumference of the first, second, third, fourth, and fifth circles. When the narrator comes back to their faith with increased vigor, I display a double-bordered circle around the last six verses. Although Herbert himself did not build “The Collar” into a specific shape, I believe that my digitization better reflects the extended metaphor of the collar that Herbert hopes to ingrain into his reader’s mind. The downside? This alteration inhibits the reader’s ability to view the entire poem on one page, screen, or visual unit: one must flip through the poem chunk by chunk in order to witness the degradation of the collar throughout. With the amendment of “accurate literary reproduction” as faithful reproduction of authorial intent, this statement complicates the question I posed at the beginning of this blog post: should digitizers prioritize exact re-creation of the text or the reader experience? Though I stayed faithful to the intended reader experience in each digitization of “Easter-wings,” I noticed that “ease of reading” worsened with each digitization that I made. Sure, I got progressively closer to animating the two wing-shaped pieces of the poem to simulate flight – what I believe Herbert desired – but, in my final digitization, it would be nearly impossible for someone to read and process the poem’s content. Could it be possible that shape poetry obscures as much as it adds? Based on my initial read-through of the copy of “Easter-wings” in Deering Library’s Special Collections, I argued yes in my first blog post. A first time reader of “Easter-wings” might feel perplexed about how to process this poem…. [D]oes the reader follow standard page conventions despite the horizontal nature of the text? I then mentioned in my second blog post that catchwords – “the first word on the next page” placed on the direction line of the previous page, according to Philip Gaskell’s A New Introduction to Bibliography – help guide the reader through the poem’s body in the correct order. Catchwords, however, were included less for the reader’s experience than for the printing press publisher’s ease of binding printed pages together into a book. What is a modern digitizer to do: preserve authorial intent or compromise it for the sake of ameliorating the reader experience? I opted for the former. 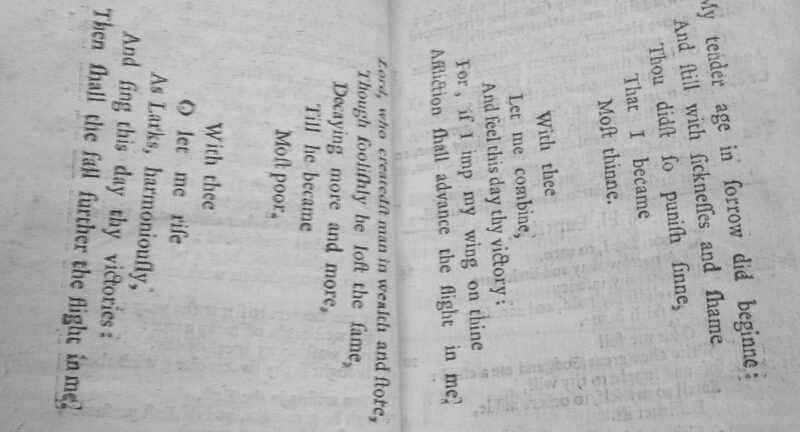 Although my digitization inhibits the readability of “Easter-wings” for the modern reader, it brings to life the wings that George Herbert seemed so thrilled to lift off of the pages of The Temple. As Nabokov would say, my final digitization of “Easter-wings” allows the reader to “visualize” the poem as Herbert likely did, an affordance unique to my web-based animation strategy. Once again, Herbert did not publish “The Pulley” as a shape poem, nor does the word “pulley” appear once in the poem’s body. Rather, the pulley operates as a conceit – an extended metaphor that compares two objects not typically thought of together – in the eponymous poem. Herbert likens each human’s relationship with God to a pulley: though God “pours on” mankind much of his “treasure,” he retains the final “jewel” so that humans stay faithful rather than “adore [the] gifts” instead of God. There exists tension in how much Herbert’s illustrated God feels willing to bestow upon humans. In an effort to capture this tension, I place a reactive pulley-like animation in the middle of my digitization of “The Pulley.” This placement splits the poem in two, effectively forcing the reader to consider what the pulley could symbolize within the poem when they are halfway through reading it as well as when they first read the title. By openly displaying an illustration of the pulley in the midst of the poem’s body, My digitization better points the average reader to the hidden conceit within “The Pulley.” All that is lost in this digitization is Herbert’s subtlety. In centering the pulley animation within the poem’s body, I uncloak the significance of the pulley. This, I contend, aligns well with George Herbert’s authorial intent: after all, why would an author create an extended metaphor if they did not wish for the reader to discover it? I hope that by alerting the reader to the importance of the pulley in this eponymous poem, I can better connect the modern reader to the author’s intended reading experience. I’ll present each poem that I’ve digitized, as well as reflect on what its digitization preserves from the original user experience, adds to enhance the poem’s significance, and masks from the modern reader. Though technically not a shape poem, George Herbert presents the text of “Superliminare” within a door- or arch-esque structure. This border matches the title well, as I mentioned in my second blog post. First and foremost, the word “superliminary” is an archaic term synonymous with preliminary and derived from the Latin word for threshold. This is unsurprising given the arch-like appearance of this page’s border and its positioning in the front of the text. My final digitization differs from my NewHive digitization in that, rather than place scans of Herbert’s original text in an intricate corridor (which, truth be told, is not synonymous with superliminary), I opted to digitize the text as well as the border, and to opt for a border that better reflected the threshold that Herbert originally placed around his poem. The most significant alteration that my final digitization has from its seventeenth century predecessor would be the removal of the bottom component of the structure. The threshold I digitized mimics arch, whereas Herbert’s looks more like a doorway. What effect does the tweaking of the word superliminary to signify an arch rather than a doorway – a different type of threshold – have on Herbert’s “Superliminare”? If anything, my choice to digitize an arch as a threshold amplifies the grandeur of Herbert’s The Temple. As the reader would encounter “Superliminare” before any of the other poems that I have digitized in a faithfully ordered complete digitization of The Temple, the presentation of an arch as opposed to a doorway may more effectively grab the reader’s attention. In an era of increasing distraction by social media and other consequences of ubiquitous computing, perhaps it is necessary to add a bit more pizzazz to this web edition of “Superliminare” for it to make a lasting impression on the reader. However, my decision to re-present “Superliminare” with an arch structure rather than inside of a doorway pushes the reader away from Herbert’s original corpus, assuming the decision to have a door-like border strongly mattered to him. If it did not, however, I maintain that an arch will inspire more excitement (if not reverence!) in the reader than a mere doorway. Replicating the intended emotional reaction to “Superliminare” should be prioritized above exact reproduction of its original form. As originally presented in The Temple, “The Windows” does not feature a window-like structure. However, tropes of glass and windows – as well as of light and color – appear frequently throughout the poem’s body. I interpret these tropes as an analogy of humans to prisms: “brittle” vessels unworthy of God’s presence, yet, at the same time, able to produce such brilliant colors when their faith is shown (and shone!) unto the world. Just like in my digitization of “The Pulley,” I chose to elucidate Herbert’s extended metaphor of windows by placing the three stanzas of “The Windows” into the panes of a tri-columnar window. To capture the “light” and “color” that Herbert claims humans can magnify with God’s grace, I added a hover effect to each of the six segments of the poem such that when a reader hovers over text, the text illuminates a jewel tone. It appears that Herbert illustrates stained glass windows throughout “The Windows” without christening them with that exact name. 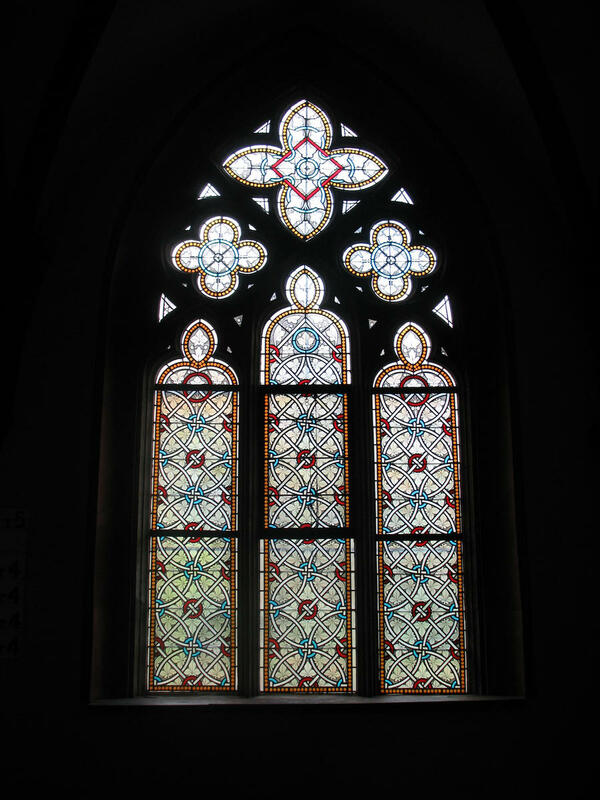 This may be due to the fact that, according to the Merriam-Webster online dictionary, the first known use of the word “stained glass” appeared in 1791 – over a century after Herbert’s death. My digitization of Herbert’s shape poetry – as well as my conversion of Herbert’s non-shape poetry into shape poetry – adds clarity to Herbert’s writing in the eyes of Ludwig Wittgenstein, but may detract from the nature of the text according to Margreta de Grazia and Peter Stallybrass. In section 11 of Philosophical Investigations, Wittgenstein laments that the “application” of printed words is “not presented to [the reader] so clearly.” As an example, he presents in section 19 several different interpretations of the word “slab”: “elliptical sentence,” “word,” “call,” or “question.” Herbert entitles many of his poems with similarly vague nouns – “The Windows” or “The Altar,” for instance – so how is the reader to understand exactly what Herbert means? I contend that Herbert’s shape poetry provides the “application” that Wittgenstein seeks in Philosophical Investigations. In “The Altar,” Herbert shapes his poem into an outline of what he associates with the word altar, which brings the reader asymptotically close to the “harmonious balance” that Nabokov describes in his ideal reading experience. With Wittgenstein’s words in mind, I preserved the shape poetry that Herbert created and even converted “The Windows,” “The Pulley,” and “The Collar” into shapes and animations that reflect the “application” of their title into something more visual. Sure, I did not build a perfect re-creation of each poem true to the Deering Library Special Collections copy of The Temple, but I made tangible the extended metaphors and tropes that Herbert discusses in his poetry. De Grazia and Stallybrass argue that it is quixotic to strive for both an “exact reproduction” and “ideal representation” of a text. Although I did not attempt for the former, I chased after the latter. I may have made assumptions about what Herbert wanted to convey to the reader, albeit assumptions that can be reasonably upheld by the presence of shapes, tropes, and extended metaphors in his poetry. While I maintain that my digitizations bring the reader closer to Herbert’s intended reading experience, it may be possible that I ascribe too much value to each of the choices that Herbert made in portraying his poems. De Grazia and Stallybrass state that “identifying an accident” can be difficult in texts from the era of Shakespeare because no “lexical and grammatical standardization” existed at that time. It is probable that at least one aspect of Herbert’s poetry that I viewed as intentional may have been exactly the opposite, which means that I may have further entrenched readers of my digitizations in an “accidental” experience. Though assumptions that I have made about the “materiality of the text” may wrest it from George Herbert’s intentions, my digitizations with shapes and animations equips the modern reader with corporeal “application[s]” that they can utilize to better interpret The Temple. I have digitized a mere six units – poems – of Herbert’s famous poetry text, and would have followed a similar methodology of digitization if I had re-created the rest of The Temple. Thus, in my digitizations, I have transformed the codex into an image- and animation-heavy browser experience that highlights and makes tangible Herbert’s Christian musings.